The benefits of using steel siding are numerous. 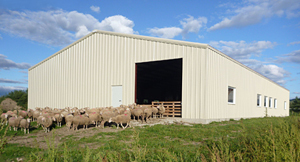 It is long lasting and economical among other things, and it is the smartest choice when considering materials for your custom or prefabricated building. Stronger than vinyl, more durable than wood, and more economical than both of these, steel siding is the perfect choice for your building. It used to be that homeowners used wood, vinyl, stucco, concrete, and aluminum for siding, but more and more now, they are opting for steel. While it is true that steel siding may not be the cheapest choice in the beginning, in the long run, it pays for itself many times over. Additionally, steel has a number of advantages that its more traditional counterparts just cannot match. One of the main advantages of steel is its durability. Steel siding can be dented, but only with great effort. However, it can rarely be destroyed. If you have a hailstorm, vinyl can be torn to pieces, but steel siding remains intact. Steel is also resistant to both water and fire. Another advantage of steel siding is its easy maintenance. Simply wash it once in a while with your garden hose. If your steel siding has been treated with protective paint, the water will not cause it to chip, rust or rot. Add to this, another very clear benefit of steel siding is the fact that will last. When properly maintained, steel siding can last for forty years or more. And with steel siding, there is no danger of termite or other insect damage as there is with wood, and you will never need to repaint your steel siding. Wood, vinyl and even aluminum need repainting. Speaking of painting, no longer do you need to buy your steel in the same old ‘steel’ color–today, it comes in a wide variety of colors and textures. And with seamless steel siding, you can have your siding designed to your specifications. It will then be wrapped around your home, so there are no unsightly gaps. While vinyl and aluminum siding are lower in cost, and to date are still the biggest sellers, many homeowners are seeing the benefits of spending a bit more upfront to get the great benefits steel offers, including monetary savings down the line. The longer lasting, more economical steel looks great and is a better friend to any homeowner.